Regarding aerocapture of the parachuting engine by helicopter, will it necessarily be a manned helicopter, or is there a possibility of an unmanned drone helicopter being used to reduce risk? Given the mass of the engines, it needs to be a big helicopter. Hadn't though about unmanned. What risk are you trying to mitigate? Hi Dr Sowers / George, it just seemed that aerocapture of a multi-ton engine pod -- or multiple such engine pods, if you fly multicore -- would be very challenging, and potentially risky to the pilot(s). 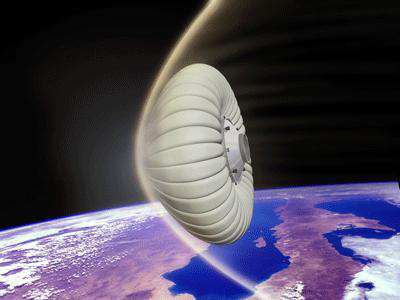 Have you considered using a ballute as your hypercone, and allowing it to serve as a flotation cushion after splashdown, to keep your engine from getting soggy? There is a lot of interest in the IVF work; a q/a like this one with answers from Frank Zegler would be great if it can be arranged. Having had the chance to talk to him about it last week, I'm extremely impressed and think that it would be great if up to date information can be shared, to the extent possible. IVF is a game changer, as reusability will be (presuming SpaceX and/or you succeed). I've asked him to field a few questions on the IVF thread. He's much more verbose than I am, so go easy. I need to get work out of him too. By the time the helicopter gets there, it should be descending slowly under a para-foil and quite safe. George, what is the expected effort/strategy to refurbish Blue Origin's BE-4? Is it a complete dismantling like with the space shuttle? Or are other techniques on the horizon, which allow fore more self diagnosis/health monitoring/in situ/etc with minimal dismantling? Feature article by Chris Gebhardt - mainly covering SpaceX, but also the competition of ULA - with comments from Dr. Sowers in this Q&A - along with Airbus.